To nourish your child’s heart and mind as we develop cognitive, social, emotional and physical skills. To encourage self-confidence and individuality by helping young children to enhance their learning and socializing abilities. To foster enthusiasm and responsibility for learning and to encourage each child’s natural creativity and curiosity. To provide a preschool curriculum geared to the different and developing interests of each child. 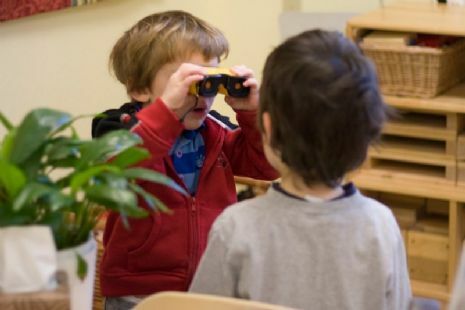 To provide a setting rich in materials and resources, a caring and highly qualified staff, a developmentally-appropriate program, and activities that are both teacher-guided and child-initiated. To provide rich and meaningful Jewish content, including education about Jewish holidays, music, traditions and the Hebrew alphabet and language. To communicate to parents the philosophy, goals and program of the Chai preschool and to provide opportunities for parent involvement and education. To enrich Jewish preschool experiences by using community resources and outside professionals in the field of early childhood education.